The series pretty much began with Jane and Molly as great friends – especially with Molly providing a lot of magical expertise and support for Jane since Molly is a witch. Now the series has never treated Molly as a servant and help has gone both ways, but it’s still nice to see the foundation of this relationship and what made these two highly secretive, careful women who are very wary of revealing their supernatural nature to others came to share so much together. Haints the second story in the book does a good job of showing some of the initial overtures – we hear how Jane and Molly first met (with Jane protecting Molly from witch haters) and we see Jane helping Molly deal with a ghostly problem – and getting Molly a good income stream, preventing people taking advantage of her. It also excellently showed off Molly’s power and skill as a witch which I really liked. There is one problem with this – while I love reading this story of how Jane and Molly came together, how they fought together and how this put them in such a solid place together by the beginning of the series, it also boggles me that Evan, Molly’s husband, has been so hostile to Jane for so long. Ok there are events later in the series that explain the rift, but given the events in this book my gods the Everhart family owes Jane some more consideration. She has done a lot for that family and really, she has earned a damn site more respect and patience from them. Really really she has. It kind of has damaged the way I look at the Everhearts now because their expanded history really makes them look terrible. I’m saddened that my opinion of these characters has now been badly shattered. We Sa and the Lumberking was another short story that expanded on Jane’s back story but in a way we already knew. When Jane was living as little more than a voice in Beast’s mind during the times when the environment was devastated by colonisation and industrialisation. 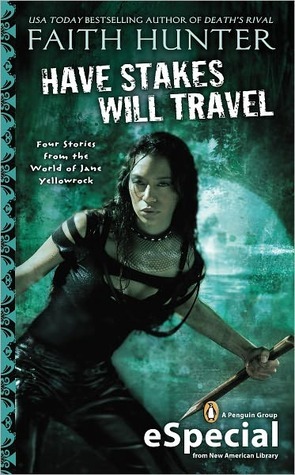 I’m glad it’s there because one thing the Jane Yellowrock series has always been good about is not romanticising Jane’s past or her history and managing to try and stop the series treating Jane’s Native American ancestry as just a source for shiny woo-woo as so many managed. That includes her history, including some of the more devastating parts of it. Yes, this doesn’t add anything to the story we didn’t need already but it’s still important. Obviously Jane is a POC protagonist, a Cherokee she also has a number of POC in her closest team. Her closest female friend is, as I mentioned, a woman, Molly and this really does a great job of expanding on this fundamental relationship. Unfortunately there are still no LGBT characters – while the book commonly appropriates the closet over and over again in relation to supernaturals – a trope I am really tired of.